Ward Blanton | Amazing Lookalike! On the left is Dr. Ward Blanton, Reader in Biblical Cultures and European Thought at the University of Kent. 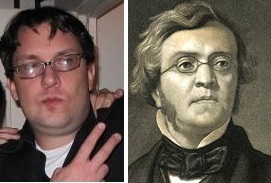 On the right is William Makepeace Thackeray, nineteenth-century English novelist and author of Vanity Fair.